DOVER – There weren't any swaying palm trees to lounge under or any icy margaritas to sip but there were lots of folks wearing straw hats, their best plastic leis and colorful Hawaiian-print shirts to listen to the sounds of Parrotville at the gazebo at JFK Commons on Sunday, July 21. 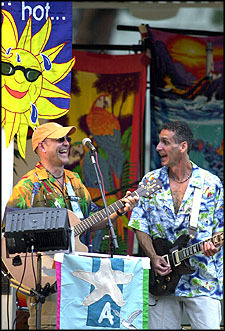 This band played some special songs by singer-songwriter Jimmy Buffett along with other tropical island tunes. 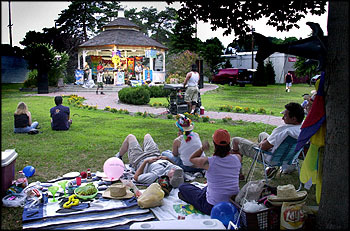 (above left) Parrotville lead singer Reme St. Martin; and Snake, on Guitar; perform at the Gazebo. (above right) The Crowd gathers for the popular Jimmy Buffet tunes. 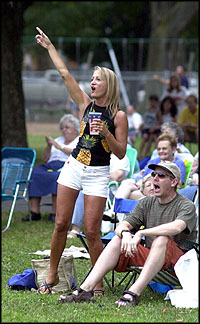 (right) Sandy Booket, of Springfield and Liam Rafferty, of Sparta, enjoy the tunes. 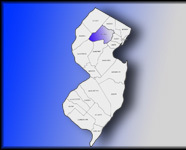 Dover is located in Morris County which places it in the center of Northern New Jersey. It is approximately 35 miles from Manhattan and the same distance from the Delaware River and the State of Pennsylvania. The town is in the foothills of the Appalachian Mountains but its highest point is only a few hundred feet above sea level. The Rockaway River flows from west to east dividing the town virtually in half creating a north and south section. Dover is bounded by the communities of Wharton, Mine Hill, Randolph Township, Rockaway Township, Victory Gardens and Rockaway Borough. The town has a population of over 15,000 residents. Dover regards itself as the center for activity in the region and is initiating plans to enhance its role as a regional center. It has all the necessary infrastructure in place with its water system not only providing water to over 99.5% of the properties within Dover while additionally servicing portions of adjacent municipalities. Dover is the largest customer of nine municipalities which make up the Rockaway Valley Regional Sewerage Authority. The sewage system services over 95% of the population and all commercial properties. Dover has a 32 man police force and a very active, well equipped fire department and rescue squad. To accomodate modern communication requirements, Bell Atlantic has available a Fiber Optics capability in their facility located in the center of the Town. Because of its widespread existing infrastructure and its geographic location, Dover is an ideal location in which to concentrate growth and redevelopment. The extensive amount of public transportation servicing Dover makes compliance with the Clear Air Act goals and objectives readily achievable. Interstate 80 and State Highway 10, both east-west highways, are within one mile of the town center, running parallel to one another, with 80 to the north and 10 to the south of the town. N.J. Route 15 and U.S. Highway 46 are entrance routes and travel directly through town. Additionally county roads #659, 643, 661 and 513 traverse the town. Bus service in Dover is primarily of two types: direct service to New York City and local service connecting Dover with neighboring communities and counties. Service to New York City is provided by NJ Transit and Lakeland bus. Local service is basically provided by Morris County Metro (MCM) which provides transportation to area malls and to other communities within Morris County. Passenger rail service to and from Dover is provided by NJ Transit on two rail services, the Morristown Line and the Boonton Line. Dover is the western terminus for electrified service. The Boonton Line has diesel locomotive powered trains that pass through Mt. Lakes, Boonton, Lincoln Park and other communities. Train service on the Morristown Line has created a variety of local and express trains that travel through Morristown, Madison, Chatham, Summit, Newark and other towns terminating in Hoboken. With the advent of the "Midtown Direct" passengers have an alternative which allows them the opportunity to travel from Dover directly to Penn Station, New York City via the Northeast Corridor Line. This capability cuts travel time between Dover and New York City significantly. The State Development and Redevelopment Plan, which in essence is the State Master Plan has identified Dover as one of only three municipalities in the entire state to be designated as a Regional Center. Additionally, the State has made Dover a participant in the Strategic Neighborhood Assistance Program (SNAP). The advantages offered by both these programs are the special priorities allowed in the awarding of grants, low interest loans and other financial assistance for development and renovations. Another factor of note is that while many municipalities within the county and the state are struggling to develop identifiable downtown centers, Dover has in place, a true downtown area and is making special efforts to improve and maintain this valuable asset. Dover is governed by a Mayor and Board of Aldermen. The town is divided into Four Wards. There are two aldermen per Ward with the Mayor elected on an at large bases. If a single characteristic was used to describe Dover's philosophy of operation it would be one of being pro-active vs. reactive. That is to say that all boards, departments, employees of the town are directed to assure that every attempt is made to cooperate with residents, visitors, and developers in a expeditious, friendly manner. For additional information contract Mr. Paul McDougall (Town Adminstrator) at 201-366-2200 Ext. 127 or Mr. Mike Hantson (Town Engineer/Planner) at 201-328-2801. Dover was founded in 1722 by John Jackson who utilized the availability of iron ore from nearby mines and the accessible water power provided by the brooks and streams in the area to create an iron forge. In 1722 the area was still inhabited by the Lenni Lenape Indians; they left by 1730. The iron forging business was the center of growth for the Dover area and remained a viable industry until the middle of the 20th century. This industry made Dover a vital center for manufacturing war materials from the Revolutionary War through the Korean War. Along with the Morris Canal and the Lackawanna Railroad, it was responsible for Dover developing into a major commercial and industrial center. Between 1900 and 1960 Dover experienced a period of economic prosperity and was regarded as the center of retail shopping in western Morris and Sussex County. There is no clear history of the acquistion of the name Dover for the town, but in 1753 Moses Hurd bought the original forge from John Jackson. Moses Hurd was said to have come from Dover, New Hampshire suggesting his influence in naming the area. Oldest written documents indicate use of the name Dover date back to the 1790's. Older documents refer to the area as Old Tye, which perhaps was a reference to Ticonderoga, New York and still other papers indicate the use of Bemen's, which was probably in reference to one of the earlier (1758) owners of the forge, Josiah Beaman. By 1800 Dover was clearly established as an industrial town, its success tied to the iron mines of the area and the production of iron goods. In 1826, while the Morris Canal was being dug, Dover was incorporated as a village and the streets were laid out and named. The main street was named after one of the new (1817) forge owners from New York City, Mr. Joseph Blackwell. The canal was completed and in use by 1831 but was soon outclassed as a transportation mode when the Morris and Essex Railroad was completed in 1848. In 1869 Dover was incorporated as a town and had a population of 3,300 inhabitants. By 1910 the population reached 9,000 and by 1960 was at 15,000. The first newspaper was printed in 1869 and was called "The Dover Enterprise", it was a monthly publication. Dr. Crittendon was the first physician to locate in Dover; the year was 1813. The first post office in Dover was opened in 1820. The railroad came to Dover in 1848, electric lights in 1889, and gas in 1902. A library was established in 1902 and the first trolley went through town in July 1904. By 1903 Dover had its own water supply plant and in 1906 the Baker Theater, one of the finest playhouses in the State, was opened. The public schools had a high school program by 1885 and designated high school building in 1901. A new Dover Shopping Center with double decked parking lot and drive-in theater was opened in 1956.